The Beatles brightened up an otherwise overcast day for 300 girls Saturday with a brief appearance at Midway Airport. But the mop-headed four were kept at least 100 yards from the clutches of all but a handful of admirers as they boarded a chartered plane for Minneapolis. Even the screams of the youngsters, drowned out by the roar of the warmup of the four-engine turboprop jet, were kept from the singers. 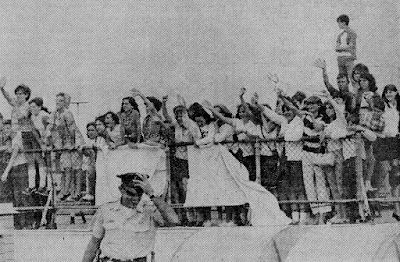 About 50 of the girls showed up for the leave-taking as early as 10am. Police apparently used a policy of divide and rule to help keep the girls in check. Officers were stationed at the main and south terminals of the airport, thus drawing crowds to both places. Nearly all the fans, many with cameras and a few carrying binoculars, scrambled to the main terminal when the plane taxied there about 1 1/2 hours before the 3 pm departure. The arrival of Tim Hudson shortly after 2 pm brought screams of frenzy from many of the girls. Hudson, a disk jockey for Station KCBQ in San Diego, California, sports a haircut like those that adorn Ringo Starr, George Harrison, John Lennon and Paul McCartney. When Hudson stepped from one of the two station wagons carrying disk jockeys, reporters and supporting acts for the Beatles. Hudson was apparently indistinguishable from the Liverpool entertainers to the eyes of admirers. 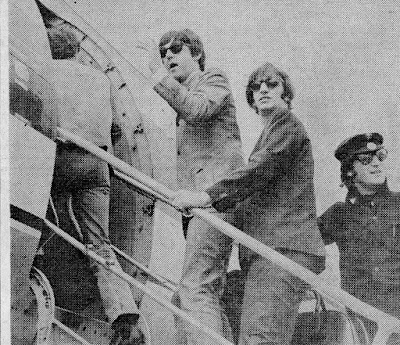 The Beatles arrived from the O'Hare - Sahara Inn, 3939 Mannheim, Schiller Park, moments before departure time. They rode in one of two chartered 1965 Cadillacs. The singers stepped from the auto, which was driven to within a few yards of the plane. They waved and posed for pictures, then disappeared into the 92-seat aircraft. Only a favored few -- several children and friends of airline representatives, for example, got near enough for a touch. On Friday afternoon and night, the singing idols had performed to shrieking, adoring audiences at Comiskey Park. Twenty-one of the 55,000 persons who attended couldn't stand it and were treated at the park's first aid station for hysteria and fainting. An Oak Lawn teenager took a more objective look at the singers while waiting for them to arrive at Midway Saturday. "It's best they only come once a year," she said. "Otherwise we'd get tired of them."